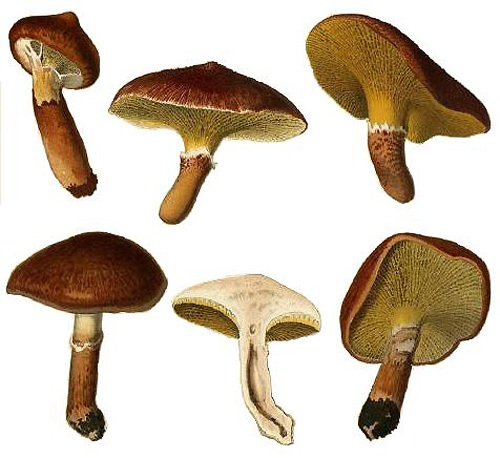 Cap up to 8 cm, fibrillose scaly, rusty to pale brown (f. cavipes) or yellow (f. aureus (Roll.) Singer). Stipe cylindrical, hollow at least in the lower part, whitish or concolorous with the cap, below the tubes with fibrillose ring. 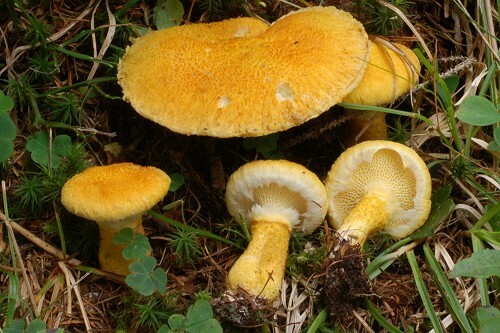 Flesh whitish or yellowish, unchanging when exposed to air. Tubes short, decurrent, pale yellow to olivaceous yellow. 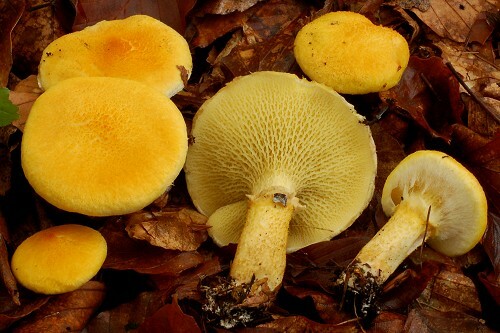 Pores large, angular, pale yellow to olivaceous yellow, unchanging when bruised. Smell not distinctive. Taste not distinctive. Spores 7–10.5 × 3.5–4.5 μm. Distribution. In Europe spread within the natural range of large, but also recorded in artificial larch plantations. The first known illustration of Boletinus cavipes, published in Kalchbrenner & Schulzer's Icones Selectae Hymenomycetum Hungariae. Klofac, W. & Krisai-Greilhuber, I. 1994. Zur Typusdiskussion des Boletinus cavipes. – Österreichische Zeitschrift für Pilzkunde 3: 1–3. Pilát, A. & Dermek, A. 1974. Hríbovité huby. 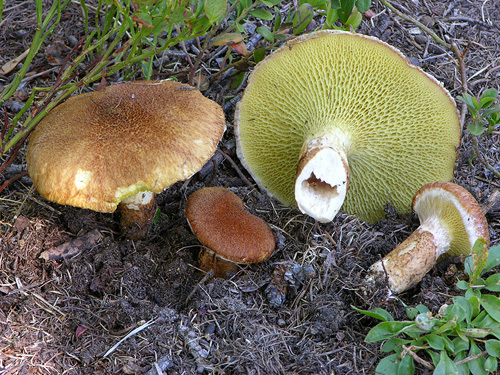 Československé hríbovité a sliziakovité huby (Boletaceae – Gomphidiaceae).Veda, Bratislava. Watling, R. 1970. Boletaceae, Gomphidiaceae, Paxillaceae. – In: Henderson, D.M., Orton, P.D. & Watling, R. [eds]. British fungus flora. 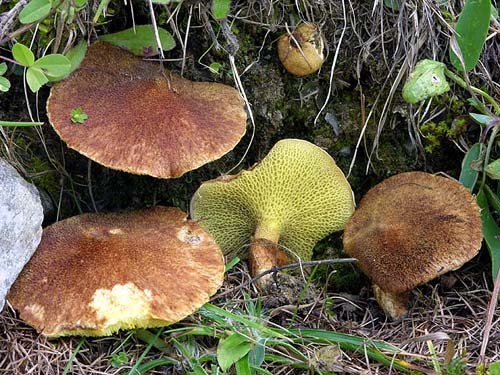 Agarics and Boleti. Vol. 1. Royal Botanic Garden, Edinburgh. Watling, R. & Hills, A.E. 2005. 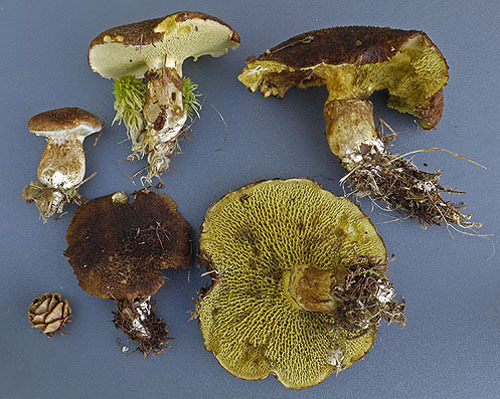 Boletes and their allies (revised and enlarged edition). – In: Henderson, D.M., Orton,P.D. & Watling, R. [eds]. British Fungus Flora. Agarics and boleti. Vol. 1. Royal Botanic Garden, Edinburgh.